Typhoon Melor Brings Torrential Rains over the Central Philippines – Weathernews Inc.
Weathernews Inc. (Chiba, Japan; Chihito Kusabiraki/CEO) has reviewed Typhoon Melor that passed over the central and northern Philippines from December 14th to the 16th leaving many victims and damaged homes and infrastructure in its wake. This is the second year in a row that a typhoon has hit the Philippine Islands in December. Typhoon Melor was a compact but powerful mini-typhoon which tracked rather slowly after making landfall, inflicting damage over a wide area. The occurrence of Typhoon Melor means that 2015 has seen at least one typhoon every month this year, the first time such a pattern has been observed in the western north Pacific since official records began in 1951. The widespread damage prompted the government of the Philippines to declare a state of emergency on the 19th. Melor developed into a tropical storm on December 11th at 0600UTC over the seas northeast of Palau Island, and proceeded west-northwest at 25kph from areas of warm seas with surface temperatures of about 29°C. 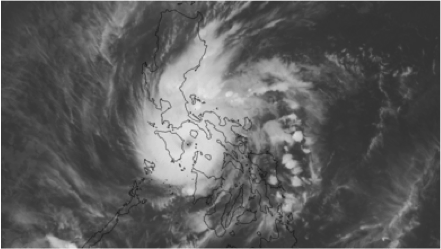 The typhoon peaked at 0000UTC on the 14th, with winds reaching their most powerful at 50m/s as it approached the central Philippines, making landfall on Samar Island three hours later. After that, the typhoon slowed to about 9kph while passing over the central Philippines. 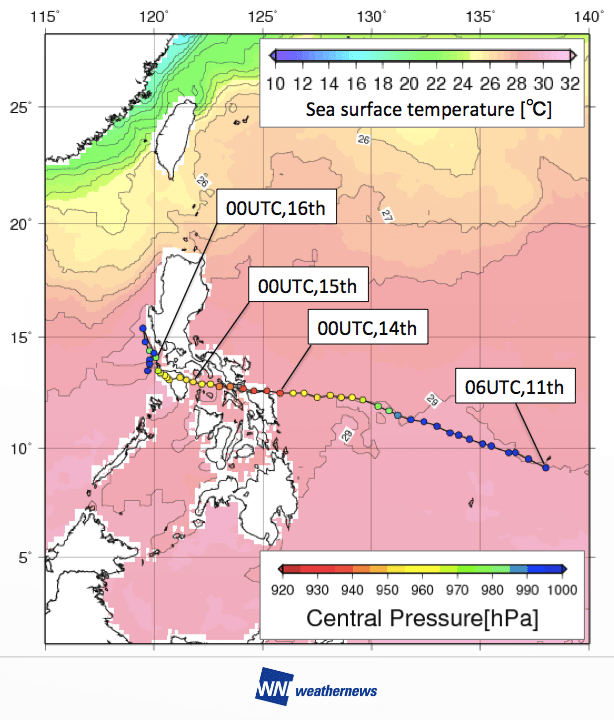 Although the typhoon briefly weakened with the influence of the terrain, it redeveloped between the Tablas Strait and Sibuyan Sea south of Luzon Island with winds reaching speeds of 45m/s at 1500UTC. The redeveloped typhoon then began to weaken once more on the following day around noon, and tracking southwest over Luzon Island at midnight. One of the characteristics of Typhoon Melor was its relatively slow forward motion due to weak steering winds over the Philippines. Due to this, heavy rains fell for prolonged periods over the affected areas. When tracking from the central to northern Philippines, Typhoon Melor wrought flooding and widespread power outages to many areas. 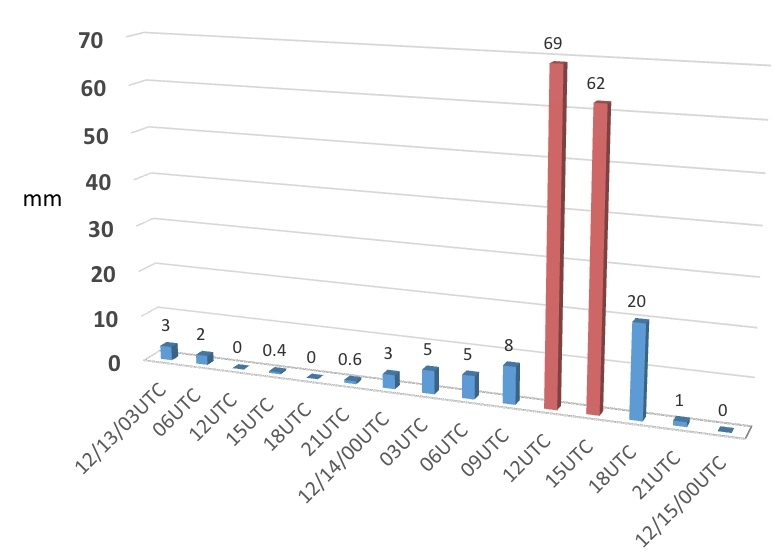 Meanwhile the capital Manila saw 205mm of rainfall over two days from the 14th 0000UTC to the 17th 0000UTC. This is about twice of the average rainfall (101.2mm) observed in December over the past five years. Secondly, compared to the previous typhoon that passed over the Philippines in December, which had tropical storm strength winds extending out over a radius of 390~440km, Typhoon Melor was compact with tropical storm strength winds extending only 170~220km in spite of its intensity. Due to this, rainfall rapidly intensified in the Philippines as Melor approached, and was extremely strong for a brief period as the center of the typhoon tracked near the central Philippines in particular. 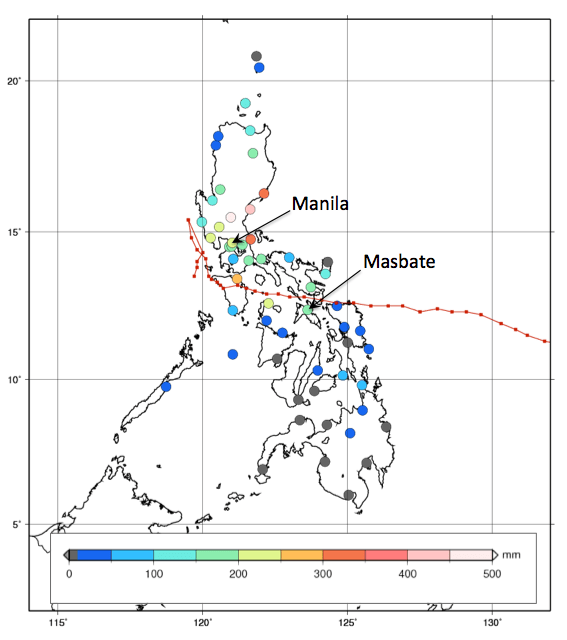 On Masbate, in the central Philippines, torrential rain of 69mm fell between 0900-1200UTC on the 14th, compared to 8mm in the previous three hours in the morning of the 14th. Rain is expected to continue to fall over the affected areas along the east coast of Luzon, so caution is urged. Weathernews continues to monitor tropical cyclone activity affecting the Philippines.